Calling all Bookworms! The Big Bad Wolf Book SALE is coming to the Philippines for the first time! 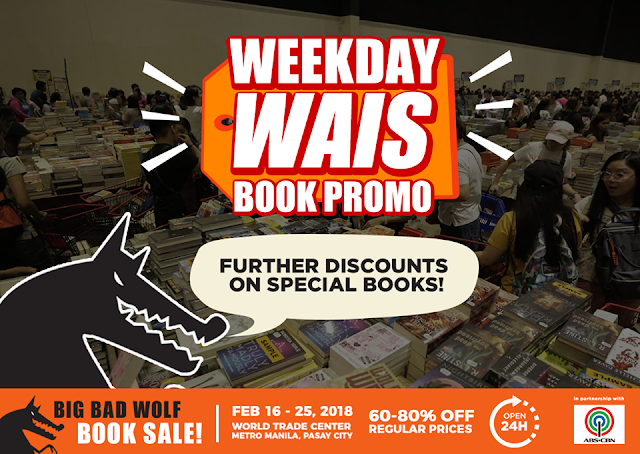 Catch it at the World Trade Center from February 16-25, 2018 and grab all the books you can for 60-80% OFF the regular prices! With over 2 MILLION books for all ages and interests, stacks of fiction, non-fiction, children’s books and MORE for you to choose from! Enjoy further discounts on special books during weekends! It’s going to be a big fiesta of books with other big surprises in store for all. Don’t worry about traffic because they're open 24 hours and admission is FREE! To those who still don't know who the Big Bad Wolf is...The Big Bad Wolf began in 2009 at Dataran Hamodal in Malaysia, as a warehouse sale by remainder bookstore BookXcess, dealing in various genres, from bestsellers and children’s books to specialist titles and deluxe coffee-table tomes. 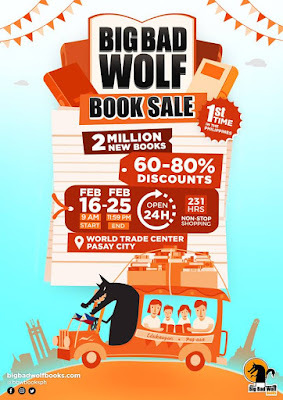 Book discounts at Big Bad Wolf can be as high as 95%! They help thousands of Malaysians every year discover the joys of highly affordable, accessible reading. Their low prices encourage customers to take a chance on new authors and genres they might never have tried before. For intrepid readers, no two visits to Big Bad Wolf are ever the same! For more info, please visit www.bigbadwolfbooks.com/2017/.